Diplomas Now, a model designed to improve the nation’s most challenged middle and high schools and the outcomes of their most vulnerable students, increases the percentage of sixth- and ninth-graders with no early-warning signs in attendance, behavior, and course performance, according to a major new study released today. This finding is important because prior research shows that sixth- and ninth-graders without early warning indicators graduate at rates two to three times higher than students with such issues. It also shows that graduation rates for sixth-graders with just one early warning sign can be as low as 25 percent. Students with no early warning signs attend school more than 85 percent of the time, were suspended less than three days, and are passing English and math. Talent Development Secondary is the lead partner in Diplomas Now, an innovative partnership with City Year and Communities In Schools. “One of the best moves high-poverty secondary schools can make to dramatically change their students’ life trajectories is to help them get through school without any early warning signs,” said Robert Balfanz, a research scientist at the Johns Hopkins University School of Education, co-founder of Diplomas Now and co-director of Talent Development Secondary. 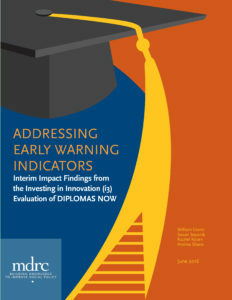 Additional information can be found on the Diplomas Now i3 Findings webpage. Watch a narrated explanation of the findings by Robert Balfanz, a co-founder of Diplomas Now and research scientist at Johns Hopkins University School of Education. In efforts to keep kids on track to graduate, a new evaluation of the Diplomas Now intervention suggests an ounce of prevention is better than a pound of cure…. read more. Today is a milestone in a decade-long quest to learn how to best support students and teachers in our nation’s middle and high schools most affected by concentrated, inter-generational poverty… read more.